It came in a small pot, but it seems unhappy. 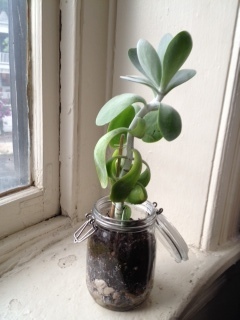 I'm not sure what type of succulent it is, so I don't know what type of pot or environment would make it happier. Thanks for your help! Hi Kelly, first of all, no succulent will be happy in a jar that most likely has no drain hole, even if you avoid over watering them. They absolutely require drainage, and most of them have a real liking for air in the soil, and 'tooth' or a rough surface for the roots to grip. This is Kalanchoe thyrsiflora, and they really prefer to be outside for the summer, and watch out - they tend to grow quite large! With a bit of TLC, this character will be over 3' tall, and top heavy. They also need bright light, more than what they might get in a window; a grow light is a good way to give it the intensity they require for the winter. I recommend using some kind of terracotta pot, which are a bit heavier than plastic or other materials. This can stop the carnage when the plant falls over in a windstorm. You can see more about these fascinating plants here; Kalanchoe thyrsiflora.